Verm-X treats for cats are a soft, semi-moist meat based treat with the added Verm-X for Cats formula. The palatable floret treats are fed on a daily basis throughout the year, providing effective parasite control for your Cat. Verm-X treats for cats are made with only the best unadulterated ingredients. 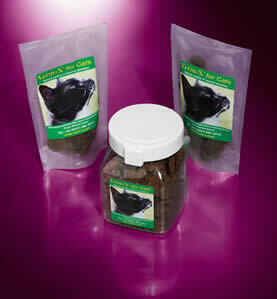 They are manufactured by one of Europe’s most respected pet treat producers. Included in the recipe are real pieces of chicken, beef, liver & catnip together with the Verm-X formula of medicinal herbs. Verm-X treats for cats are irresistibly tender and can be used for reward, adding to meals or for use in activity play balls and are suitable for seniors, adults and kittens. The treats also contain 100% natural catnip which helps stimulate cats and kittens to play and exercise, also making them ideal for older cats and those prone to weight gain with the treat being gentle on the digestive system. The Verm-X formulation will expel internal parasites, however the garlic ingredient will also render your cat less attractive to fleas, ticks, lice and other pests (we do not recommend you use Verm-X treats as a substitute for your flea treatment). Verm-X cat treats can be used for reward, placed in meals or activity play balls for extra fun! Feed one half of a treat (4 segments) daily to your Cat (over the age of 6 months and seniors). For Kittens between the age of 4 and 6 months feed 2 segments per day. We do not recommend that you use Verm-X as your sole roundworm treatment for kittens at 4 months, as the Verm-X formula must build up in your cats/kittens system to be fully effective. Do not use Verm-X on pregnant cats. The Keep-fresh Jars are re-usable food grade very solid containers with a hinged lid incorporating a rubber seal for keeping the contents fresh. All packaging is recyclable - please follow the recycling code.